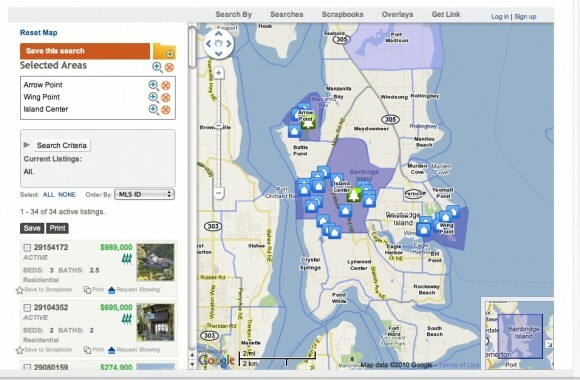 I’ve invested in a new, innovative IDX search program that will allow real estate shoppers to search for homes by neighborhoods on Bainbridge Island (and beyond). It also has cool geo-coding features to map parks, schools, restaurants, homes of particular interest, etc. 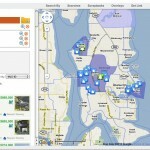 I think it will be a great tool for clients to use as they learn about Bainbridge Island. I know I had a really hard time visualizing the layout of the island, this would have helped me as I was researching from afar. Click here or click the map below to give it a test drive. Please email me if you have any questions, or encounter any problems. There is an option to save your searches or not, no pressure. I think you’ll like the intuitive format of the site. I searched high and low to find a user-friendly, informative search and I found this to be one of the very best. Enjoy. Why in the World are You in Real Estate? This is not, I repeat, this is NOT what it looked like at our house after the moving van pulled away. Nor is it the scene at a “typical” new home. If you’ve read my blog, you might know that I used to be a classroom teacher. I got my teaching credential, then my MA in Education, became department chair, a mentor teacher, yearbook advisor, newspaper advisor . . . you get the idea – then in the span of three years had two kids. A year later in the summer of 2004 I was diagnosed with a rare form of skin cancer. After kid number one, teaching, the way I liked to do it, had already become a challenge, a strain, not fun anymore, but I was muddling through it. However, when you have a doctor outlining treatment options for your cancer, one positive side affect is an amazing amount of clarity. So, one day not long after I had gone through surgery and tests and treatments and found out I actually was going to live to see another year of teaching, my husband asked me what it was I really wanted to do – and I love that he said to put money aside, because that was my big hang-up about quitting teaching, my salaried position. My salary was not making us rich, but it was a predicatble, monthly salary – so, with money aside, without hesitation, I said real estate. Since I so clearly now knew that life could indeed be short and my heart was no longer into teaching, I decided to risk the unpredictability of being paid on commission and within a few weeks I was studying for my real estate test and became a licensed agent in 2005. I became an agent in CA as the pin was piercing the real estate bubble. Even in the decline, I found fast success as a listing agent, primarily a re-listing agent. Being the second agent, I brought new energy, aggressive marketing, and a compelling price, which got the houses sold. Since the bubble burst was such a fun run, I moved up to the Seattle market in 2007, just as their bubble was bursting, for yet another round (I hope you are getting my sarcasm). And now, in 2010, I am still riding the blast of that bubble. No, for me and real estate the affair has not been about money (my goal has always been to make my old teaching salary) the affair has always been about the customer service aspect of helping my clients get where they need to be. But, I’ve done well in both departments, and I attribute that to the simple fact that I am doing something I love. Moving to Bainbridge, and becoming a newbie agent in this insular market, was not easy, to say the very least. But I feel very fortunate that I was able to find my new place and define myself primarily as a techy relocation agent. Moving north was not super easy for me on levels beyond my career. My roots in California ran deep after being a California girl for 35 years. But, I recognize that others are going through the same physical and emotional struggles I did – moving your life is not easy. So, I feel very privileged when clients ask me to assist them during this major life change. When I (as an agent at the time in CA, mind you) was looking for an agent on Bainbridge Island to help us with our move I knew what I was looking for. I wanted someone who had time for us. I did not want a super busy agent with assistants and twenty two listings (not that there’s anything wrong with that). But, being in the biz, I knew they would not have the time for all of my stressed out calls and queries for help about where to take my bored children to find other bored children. I found a good agent, who helped us buy our house. She was there for us and helped us negotiate a good price for our house. But, our moving experience helped me realize that people relocating also need help with the emotional move, the transition, the changes, not just the purchase of the house. Each day I am striving to be the great agent I was looking for to help us buy a home and to help us with our move. I love what I do and I hope through my life experiences and my love for real estate I can help others make their move and find their place on Bainbridge Island. How did I forget to put this on my list of things to do in October? IslandWood never disappoints. Their campus is nature refined! 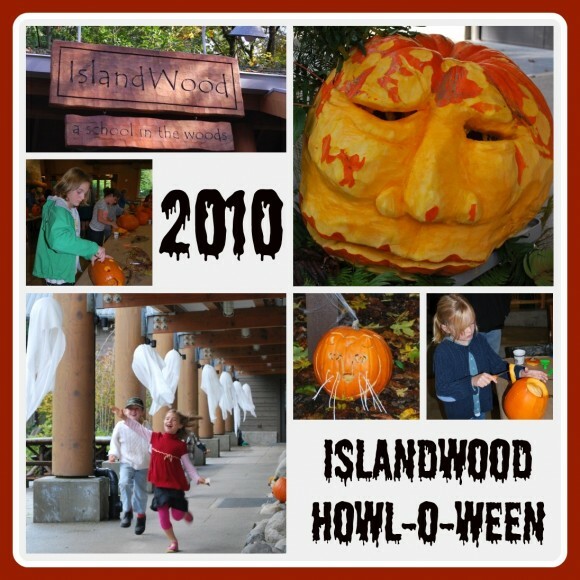 IslandWood was a cozy place to spend a rainy afternoon while the kids carved pumpkins, listened to stories, ran around, and enjoyed cookies and cocoa from their comfort kitchen. 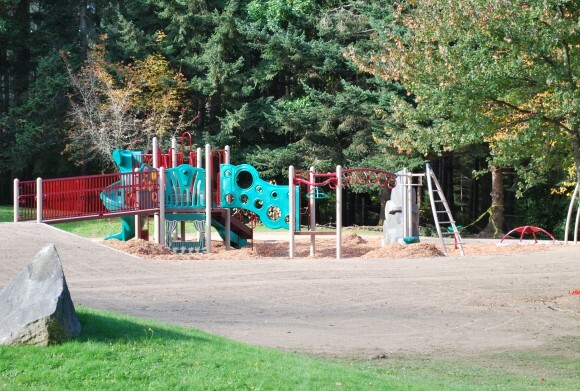 The new play structure at Eagledale Park on Bainbridge Island. Play structure with covered picnic area. Tennis/volleyball courts at Eagledale Park. 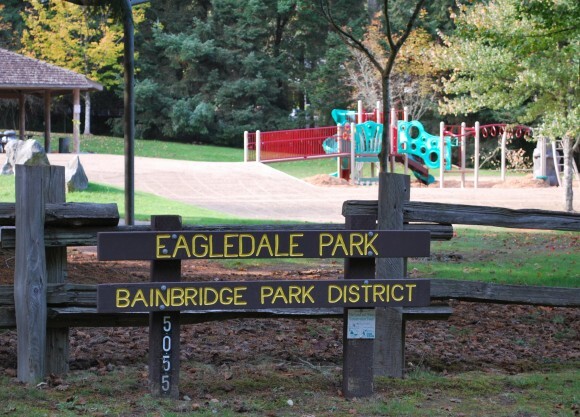 Eagledale Park on Bainbridge Island. I was out looking at a house for a client, when I noticed the bright and shiny new play structure out at Eagledale Park. The guys with the Parks and Recreation Department said it should be open and ready for use this weekend (10/22/10). What a great addition to this quiet park. 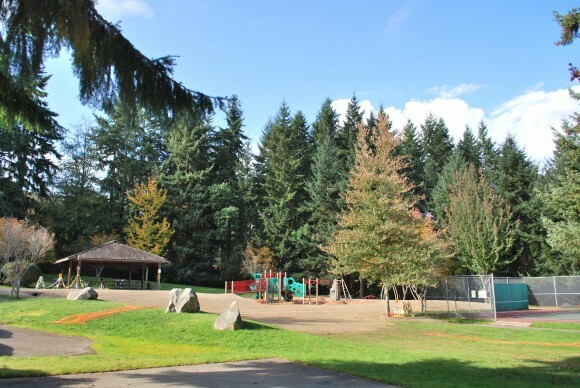 Eagledale Park is also our off-leash dog park. 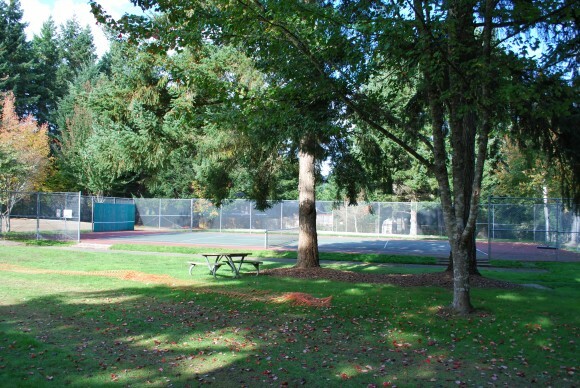 The 6.7 acre park is home to a covered picnic area, tennis/volleyball courts, basketball court and the Parks and Recreation Department’s Pottery Studio. Click here for more park info. Buying a home in today’s market could be one of the best financial decisions you make. At our office meeting this week, my Managing Broker, Casey McGrath brought up an article about how a broker in San Jose, Lisa Blaylock, had an appealing philosophy that got her clients to look at the market with a new set of lenses – and ultimately got fence-sitters to hop off that very crowded fence. We agents in the field have all worked with buyers this year (and last) who have look and looked, weighed, wondered and worried – but have not put pen to paper. And, of course the national economy and the news feed their fears about buying or even entering the market as sellers. Blaylock began the dialogue with her clients that helped them see that the state of the national economy was not nearly as important as their personal circumstances. She asked them questions like, how is the stability of your job? How much equity might you have in your house? Do you want to move-up to larger home? Through her conversations and investigations Blaylock found that the vast majority of her buyer clients had stable jobs with good incomes and savings in the bank. She also found that many of her sellers actually had a good amount of equity in their homes too. Looking then at the national economy coupled with personal circumstances, she and many of her clients together came to the conclusion that now may actually be the best time for them to make a move. With interest rates at a record low and a healthy amount of inventory, move up buyers, for example, could price their current home aggressively and take advantage of today’s market to find their dream home. 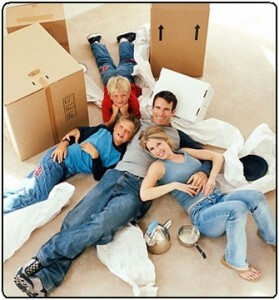 Down-sizers can also benefit from getting a great value and interest rate on their new purchase. But, we also know folks out there who are thriving. One of my friends is an Acupuncturist, all-in-all a small business owner, yet her practice has not skipped a beat in the past three years. Another friend of mine is a firefighter in CA. The hiring freeze on firefighters led to a boom in overtime for current firefighters during the fire season – they paid cash for a new built-in pool. And even in the challenging world of real estate, some savvy agents are having record years. 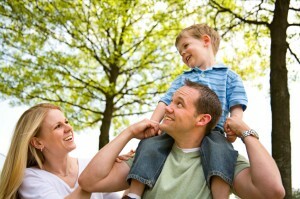 I have seen many families put their goals, hopes and dreams on hold out of fear. If buyers and sellers reluctant to enter the market do a little self-assessment, they may very well find that they can and should move across the country to be closer to granchildren or family. They can sell their current home they’ve outgrown and get the large home they’ve been needing, or they can sell the big home they no longer need as an empty-nester and buy the waterfront condo they’ve had their eye on. The national economy will likely take years to straighten out – I think it is a good idea for those who can to not to put their your goals on hold for that resolution. So we all need to remind ourselves to look around and pay attention, but remember to stand back and take stock of what is going on at home. If folks pay attention to their goals the “personal economy” may be the very best indicator one has when making the decision to enter today’s real estate market.